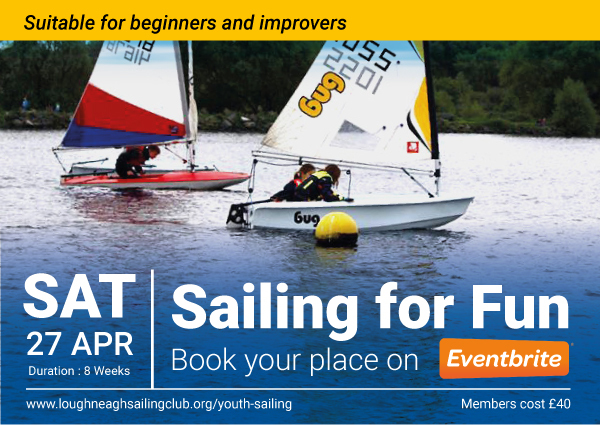 Sailing for Fun #1 is an 8-Week sailing session for beginners/improvers (suitable for ages 8 upwards), perfect for getting out and having fun on the water. The course will be delivered by qualified instructors and has been created to learn and develop basic sailing skills. The sessions will involve some sailing theory but be mainly focused on time on the water. Starts Saturday 27th April 9.00am – 12.00pm for 8 weeks every Saturday. MEMBERSHIP of Lough Neagh Sailing Club is a requirement. Non-members please contact us to find out how to participate in Sailing for Fun. No previous experience is required although participants must have basic confidence around water.